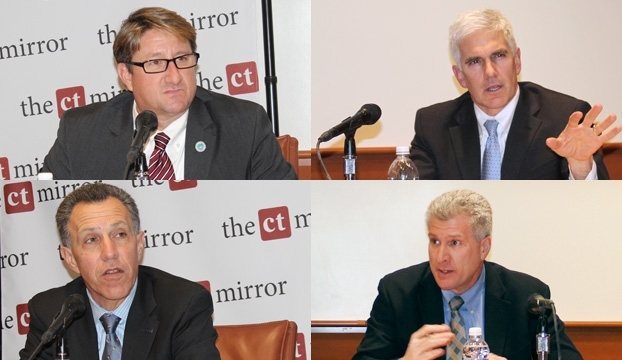 The panelists included Todd Andrews, Vice President for Economic & Strategic Development at Goodwin College; Sal Filardi, Vice President of Facilities & Capital Planning at Quinnipiac University; Richard Jacob, Vice President for Federal and State Relations at Yale University; and Jeff Seeman, Vice President for Research at UConn. Each speaker offered an overview on how his organization was contributing to The Knowledge Economy. Mr. Andrews spoke of Goodwin’s mission to support not only traditional college-age students, but also career-focused adult learners who work to balance the responsibilities of work, family life, and school. Following the overviews, the panelists focused on more specific topics that included curriculum, support sources, expansion and land development, risk taking, and sustainability. Connecticut Conference of Independent Colleges website. Most students can attest to a teacher who inspired them and helped to change their lives. Jamie Mattos, on the other hand, is a student who has permanently and positively affected Goodwin College. 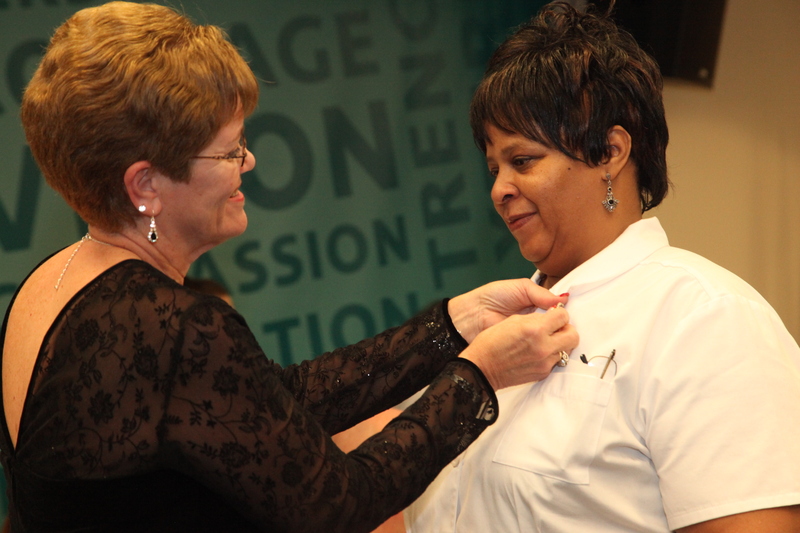 Nursing Program Director Jan Costello pins Jamie Mattos during a ceremony held in December. Mattos, who is now seeking her RN-to-BSN at Goodwin, has become one the of College’s most active student poets. Mattos, who received her associate degree in Nursing in December 2013, is the embodiment of the Goodwin College mission. A mother and grandmother who has endured more than her share of life’s challenges, she thrived as a student and continues to develop a voice and presence in the Goodwin community that resonates beyond the classroom. As she struggled to balance her family responsibilities with her student obligations, Mattos sensed the need for a creative outlet. She eventually found the perfect escape in a most unlikely interest: her passion for poetry. Her verse, heavily inspired by her life experiences, has helped her cope with the changes that she has made in her life and propelled her as a leading voice of the student body. She has been featured in poetry jams, published in Goodwin’s Beacon magazine, and soon plans to self-publish a book of her favorite pieces. Mattos was in a difficult situation when she arrived at Goodwin College in 2010. She was a single mother raising her eight-year-old daughter, Jiana, who had been diagnosed as schizophrenia and autistism. Plans to sell her house and move South were dashed with the decline in the housing market, and a series of harrowing car accidents had forced her onto disability and out of her career as a computer programmer. “I needed a new plan, and it took a while to figure out what I was going to do,” she says. Friends suggested that Mattos would make a good nurse. She visited the Goodwin College River Campus and met with academic advisor Glenn Black. He recalls how Mattos worried about her age, her ability to be a student again, and especially Jiana’s needs. After a “long talk,” Black says, she realized it was the right decision. By that time, Mattos was nearing 50 and her older daughter, Jessica, was expecting a little girl of her own. She was at a critical juncture, and she had to sell the idea of returning to school not just to herself, but to her growing family as well. “It hasn’t been without struggles and tears,” Mattos says. Despite her initial concerns, Mattos started at Goodwin and soon found an environment where she could thrive. A dedicated student, she found herself doing well in her classes, and inspired by her classmates, instructors, and a culture that embraced her. Soon the challenge shifted from whether college was right for her to whether she could afford to continue. Though she received financial aid, Mattos and many other Goodwin students faced a crisis when the state legislature threatened cuts in the Connecticut Independent College Student (CICS) grants. As a nonprofit, private institution, Goodwin College relies on CICS funding to provide opportunities to students. The cuts would have significantly impacted several colleges throughout the state. Mattos was inspired to speak out against such a measure and volunteered to appear in front of the Connecticut State Legislature’s Education Committee. In 2011, she found herself sitting before the committee, as well as television cameras and reporters, to plead the case against the cuts. Mattos’ testimony was taken to heart. The Legislature moved to exempt colleges with small endowments, such as Goodwin, from the cuts. Mattos was later accepted into the Nursing program and began the rigorous course work. While concentrating on her labs, clinicals, and other technical courses, she discovered a more creative outlet through another voice that had been developing inside of her, that of writer and poet. English professor Cynthia Hendricks was one of the first to realize Mattos’ talent. Hendricks encouraged Mattos to continue to write, not just for class assignments, but also for herself. “I have seen such tremendous growth in her writing, from her initial submissions — personal, insular, and mystical — to opening up in her later work to a broader audience with a wide range of appealing strategies,” Hendricks said. Inspired by some of her favorite writers and poets, such as Maya Angelou, Rudyard Kipling, and Edgar Allen Poe, she developed a style that ranged from playful to serious. The poems draw on her life experience, age, race, and gender. Mattos’ poems touch upon many themes — faith, femininity, cultural pride, shame, humor, and love. In Grace, she explores religion as a shield against the sometimes harsh realities of the world. That is where you will find the essence of you. That shields your spirit from the crush. It wasn’t long before the College published some of Mattos’ work. Her confidence grew, and Mattos found herself performing her original verse before audiences of students and administrators. As the end of her nursing education approached, Mattos found life becoming much more manageable. She and Jiana moved into one of the College’s properties in East Hartford, and her daughter found classroom success at a local elementary school. Mattos’ nursing clinical experience brought her into the oncology ward at St. Francis Hospital in Hartford, where she connected well with her patients. Although she was working with patients who were suffering from cancer, Mattos wasn’t intimidated or overwhelmed. She says that her age and own experiences contributed to her ability to forge good relationships at the hospital and find commonality with those she served. On December 19, 2013, Mattos and her cohort were pinned as graduates of the associate degree in Nursing program. Her family, who now understand that her sacrifices and return to school were worthwhile, cheered her on as Program Director Jan Costello placed Mattos’ pin on her nursing scrubs. But Mattos isn’t done with Goodwin College yet. She continues her education here, now in the RN-to-BSN baccalaureate degree program. “You can’t get rid of me that easily,” says Mattos, with a wry grin. Goodwin College is pleased to announce that the new Dental Hygiene program has received accreditation from the Commission on Dental Accreditation (CODA) as of Thursday, February 13. The Commission is a specialized accrediting body recognized by the United States Department of Education. With its blend of traditional classroom and online learning, Goodwin’s Dental Hygiene Associate Degree program has been gaining attention across the state and in the national media. This innovative program, designed specifically to meet the needs and schedules of Goodwin students, is slated to open in May 2014. Carmen Hufcut, Director of the Dental Hygiene program, oversees its overall development and academic integrity. With more than 20 years of experience in the field and a thorough understanding of Goodwin’s student population, Hufcut was the perfect fit for this new position. Born and raised in Puerto Rico, Hufcut learned English as she went through college, and — like many of our students —became the first in her family to earn a degree. As enrollment for May progresses and Hufcut’s leadership sets the stage for a successful inaugural session, the program is attracting attention, including an article in the spring 2014 dental industry publication Incisal Edge Magazine. Click here to view. For more information on the program, visit our majors webpage.